Philip’s new bride, 18-year-old Princess Ingeborg of Denmark, was described as having a good heart. That might have been a clue to what happened next. The 15th of August was the royal wedding day. 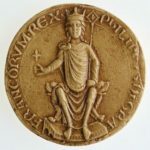 The widowed Phillip II of France, 28, was marrying for the second time. His first wife, the tall (5’9”), lovely Princess Isabella of Hainault had died three years earlier, at 19, giving birth to twin boys who did not survive. First, the wedding. Then the wedding night. Whatever went on that night, Philip was repulsed. In the morning, he repudiated Ingeborg, sent her away as a virtual prisoner to another castle, pleaded with her father to take her back, and petitioned the Pope to annul the marriage. When he claimed they had not made love that night, Ingeborg, now Queen of France, vociferously disagreed. Her father and the pope sided with her. Next, Philip had a family tree drawn up that showed he and Ingeborg were too closely related to be married. 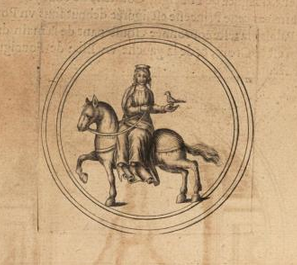 No one believed that, so Philip had Ingeborg imprisoned in the tower of a castle, with no visitors allowed and often not enough food; her Danish constitution enabled her to survive, although she complained in letters of being suicidal. Philip next contracted a marriage with Margaret of Geneva, who was horrified at the idea of becoming his wife. How fortunate for her that on her way to the wedding in Paris, she was kidnapped by the family of her true love! 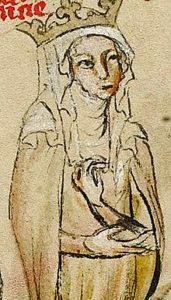 Philip married again, this time to Agnes of Merania, but threatened with excommunication for being married to two women at the same time, he gave her up in 1200. Exiled to a nearby castle, young Agnes died of a broken heart. Ingeborg outlived this new wife. Philip reluctantly recalled her, to get himself out of all kinds of religious and political trouble. She outlived Philip by 13 years. Ha! Love that she outlived him. She had 13 years to savor outliving him!